Xeni Jardin’s new NPR podcast “Xeni Tech” just launched today and will include Xeni’s past and future NPR reports. Today’s launch featured Xeni’s “Day to Day” story “Guatemala: Unearthing the Future”, a five part series based on her travels through Guatemala that begins with Forensic Anthropology Foundation of Guatemala (FAFG) efforts using forensic technology to identify the more than 200,000 people killed in Guatemala’s 36 year-long civil war. Xeni has been involved with this project for several months now and it’s great to see the results of all of her hard work. 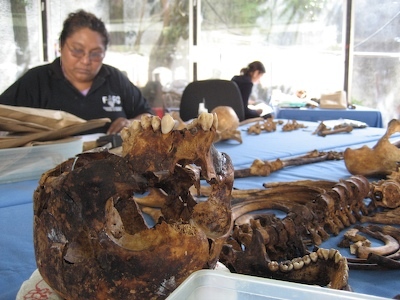 The first of these reports focuses on a group called the Forensic Anthropology Foundation of Guatemala (FAFG), a nonprofit comprised of technologists, anthropologists, and archaeologists who unearth mass graves from political massacres. They work to identify the dead and return the remains to their families for dignified reburial. The process begins with the hard work of the exhumation itself, but they also use DNA forensics and software they develop themselves, so they can identify a greater portion of the remains, and preserve evidence that could be used in criminal trials. FAFG staff routinely deal with death threats from those who do not support their work. Xeni has posted more about this over on Boing Boing and her trek blog.